Corby Town youngster Jordon Crawford has been rewarded for an outstanding season by being named the Young Player of the Year in the Evo-Stik League South. The 21-year-old was on hand to collect his award at the Northern Premier League’s 2018 Player of the Year Awards ceremony in Barnsley last night (Sunday). Former Northampton Town manager and current Sheffield United boss Chris Wilder was on hand to honour the winners while over 300 guests were in attendance for the event, which was broadcast live on Facebook and Twitter. 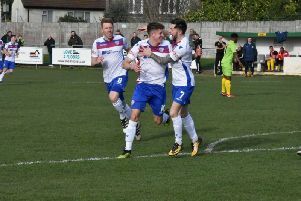 Crawford has enjoyed another excellent campaign at Steel Park and is the Steelmen’s top scorer with 14 goals in all competitions with his most recent one being in Saturday’s 4-2 victory at Newcastle Town. He attended the ceremony with manager Steve Kinniburgh and team-mate Connor Kennedy.